Sunday morning, we picked up our friend kelly and her Special Skills Dog Guide, dayton. We drove to Oakville to drop off Canyon, and then headed to Toronto. This year was Woofstock’s 10th anniversary, so we were eager to attend. The vendors were all set up along Front Street and the rescues were located in a park on Church Street. For the most part, I thought this year wasn’t as good as past years. there were still lots of vendors, rescues and people in attendance, but there didn’t seem to be many people giving things away and the rescues were set up in a way that was completely inaccessible to anyone who could not walk along the grass. our friend, Kelly, had brought her manual wheelchair, so this meant the rescues were out. Since there are a lot of dogs and people who cannot control their dogs, we carried Cessna and Rogue’s working gear in our backpacks, instead of having them wear it. We didn’t buy too much this year. Since Rogue tends to get gas and loose stools from kibble and most commercial dog treats, we stayed away from most vendors. We tried a few new treats with the girls, but only two made the cut, the rest were ignored or dropped on the ground when we offered it. The two things we did buy, were dehydrated lamb liver from Nothing Added and lamb, apple, cinnamon treats from Wellness. We also got a couple of free plastic frisbees and tennis balls for Canyon, but were unable to find anything else too exciting. I think I’m going to try and email the Woofstock organizers to see if they can return the event to being more accessible. After we had spent a few hours walking around, we got back into the car and drove to Oakville. We had dinner with our friend Della and her daughter Kelsey, and then returned home, completely exhausted. I thought I’d first begin this entry by updating everyone on how Teal and Amber are doing at their new homes, then updating everyone on how Lynette is doing at GDB. Teal looks to be doing wonderfully with his foster mom. I have not yet had a chance to get together with her or see her on an outing, but I am sure that soon enough we will cross paths again. Amber has now been with her foster mom for almost 3 weeks and also looks to be improving nicely. We have run into them a couple of times and Amber still seems to have a huge attraction to Aiden, but at least now she is settling down quicker and not stressing when she can’t be near him. Amber seems to be learning things quickly, she rides on the bus every day without any issues and attends school with her foster mom, settling down for a nap once they get into the classroom. The only real concern right now is her fear of traffic. I think with time though she will get through this fear…I guess living in a small village she didn’t encounter much traffic in the first few months. I will post some new pictures of both Teal and Amber once I get some from their foster moms. We will be seeing Amber again on Monday and this will be the first real time her and Aiden will be working side by side…hopefully it will go well. 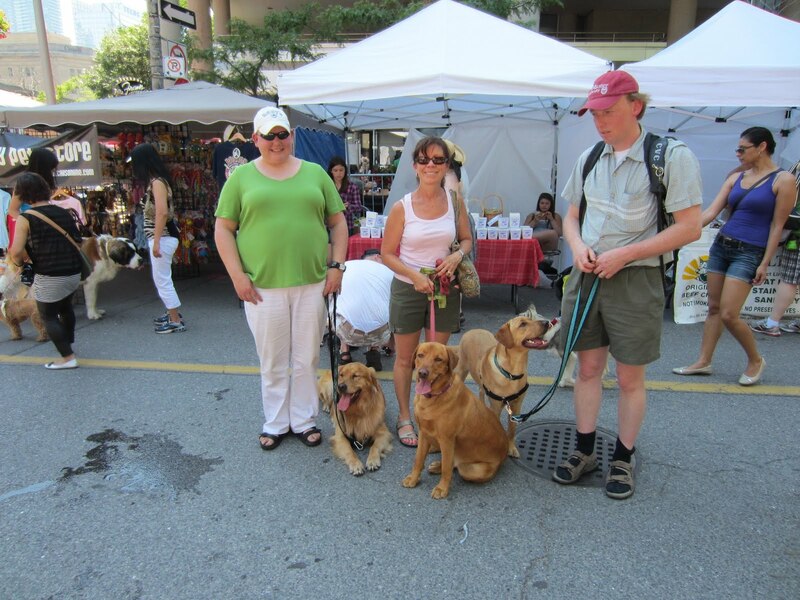 Lynette has now been at GDB for almost 2 weeks, just one more week to go and she will be on a plane back to Toronto. 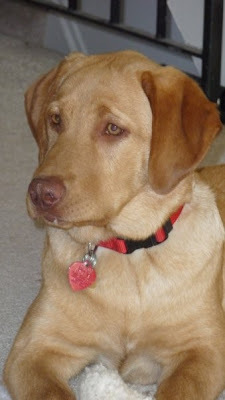 She was placed with a fairly energetic and challenging female yellow lab at first, but after just a few days the dog began to show a lack of confidence, so Lynette decided that a dog change was necessary. She now has a tiny female black lab who works extremely well, but is also playful and challenging at times. If you are interested in seeing more about how she is doing and learning a little about her former guide, you can visit her blog at http://lynessence.typepad.com/. Last weekend was a pretty busy one. On Friday we went to a friend’s graduation barbecue and then on Saturday we attended a Labrador retriever breeder show. If that wasn’t enough then Sunday we spent the entire day in Toronto, in the morning we attended the Walk for Autism at Nathan Philips Square and then in the afternoon we walked around Woofstock. The barbecue was fun, we spent about 3 hours there chatting with my friend and listening to stories her friends told about random things. Aiden and Cessna both came with us, Aiden was pretty interested in Jess’s friend’s guide named Cotton. Cotton is a bernese lab cross so is quite large and well energetic to add to it all. Aiden tried to play with Cotton for a while, but Cotton began to be a little too rough with him so we stopped the games. Cotton is over 85lbs and Aiden was 49lbs (now 54lbs!) at that point so we worried about having an Aiden pancake if Cotton were to actually sit on him, which he was trying to do. The lab breeder show was also pretty interesting, we were helping out at the Autism Dog Services booth, but also got a chance to walk around and see the different kennel’s booths and food vendors. Purina was giving out the more interesting stuff, they gave us a bag and told us to take as many treats as we wanted, they weren’t packages, but out loose for people to let their dogs test. Sunday was very tiring, but fun and a great experience for both Cessna and Aiden. At the walk I stayed with Cessna at the booth, I didn’t want her to get too overheated – it was over 30 degrees celsius out and she is a black lab. At the booth I was with another foster mom and we took turns answering questions about the organization. It is amazing how many people look at the name of the organization and assume we work with autistic dogs…well I really do hope not, but then again are there autistic dogs out there? Another interesting, but strange question we were asked was if the dogs bite…sir I really do hope not, but if they do of course they wouldn’t continue in the program. Since we didn’t have any ADS fosters at the booth during the walk, we decided to put a training coat onto Cessna, people really didn’t notice the difference and to be honest I think she was a pretty good mascot for the organization. People and kids came up asking to pet her and she just laid there sun bathing…Cessna you are a black lab, how can you find sun bathing fun? Some parents told me that Cessna was such a good girl because normally their kids were afraid of dogs, but for some reason were attracted to her. One child asked to give her a treat and well she is the one dog of mine that I completely trust to allow a child to give her something. After the walk was over we headed over to the Eatons Centre to cool down and grab some lunch. At Woofstock there were tons of people and tons of dogs…why do all small dogs seem to have an issue with dogs that are larger than them? While walking through the crowds poor Aiden was snarled at and even snapped at by all sorts of smaller dogs…another question, why do people insist on allowing their dogs to walk on flexi leashes in crowded areas? I would think common sense would tell people to use a shorter leash in such places, but then again not everyone seems to understand common sense. Once we finished walking through all of the exhibits we began our trip back to the car. Aiden was so exhausted, he wanted to stay on the subway train rather than get off and go home. I thought at one point we were going to have to carry him. This week has been off and on busy as well. Huib has been working a lot and my sister and her cat moved in for the year on Monday. I attended a presentation on Tuesday night at the Legion with Cessna…it was a presentation on K-9 Helpers so it was useful information. On Wednesday I officially began my volunteering with the ABI program at our local long-term care home. It was nice getting to know all of the participants and staff. Cessna slept the entire 2 hours we were there, she is not a morning dog so waking up at 7:30am wasn’t her idea of fun. Today I did my second day of working with K-9 Helpers, I think I am going to really enjoy this job. I have been assigned many different tasks and all seem to have elements that will challenge me both skill wise and comfort wise. I will continue to write updates as time progresses. Right now my main task is to learn all I can about the organization, so not currently a real challenge, but I will make sure I put all my effort into this job because it’s not often that such a wonderful opportunity is set before someone.